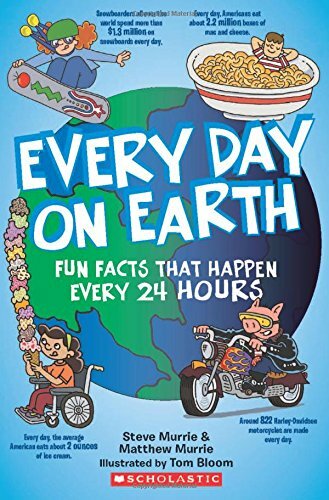 Both are true for Every Day on Earth, a compendium of interesting facts covering what goes on around the world each day, divided into categories: Living Things, Earth, Food, The Human Body, Pop Culture, Space, Technology, and Sports. Each blurb is accompanied by a cute illustration appealing to children, as are the book’s bright colors and chirpy narrative. Adults may struggle with the typeface, either for its happy bounce or the lack of distinction between commas and periods. Aside from that, it’s an easy book to read and belongs out in the open around the house rather than on the bookshelf, because it’s great for spot entertainment, or for breaking the ice at parties, or simply for reinforcing knowledge in oneself or one’s kids. Not all entries are so universal. Most are filtered through an American bias, which is no surprise given the U.S. authors, publisher, and target audience. As well, many entries have a moral or environmental undertone that’s transparent, on one hand, but important, on the other, and is what makes Every Day on Earth an educational book. This educational pill is tasty to swallow and makes learning fun—just as those old-time advertising slogans claimed.